Cherise went out of town for the weekend, leaving me with Jacob for 2 whole days. We both wanted us to all go together, but it just wasn’t possible this time. Cherise left on Friday night after Jacob was already asleep. Saturday started at 6:15am (good thing I went to bed early!) I got him out of bed, and we went to the kitchen where I had my coffee and he had his milk. We both ate and then I got him ready and we went to the park. From there, we went to Erewhon so I could grab a Bulletproof Coffee (never a bad idea to supercharge your day when alone with a toddler…). 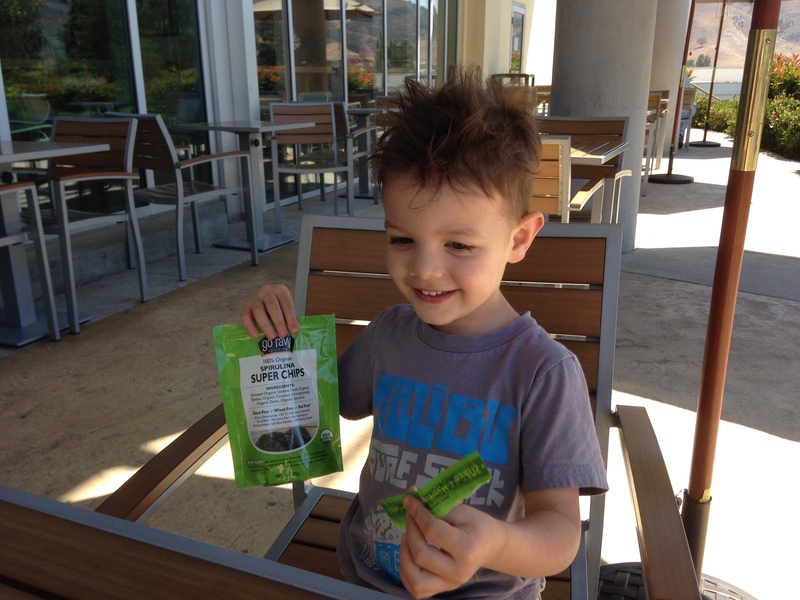 He loves it there – I had my coffee and he ate his spirulina super chips. Then we went home for lunch. The afternoon held a visit to Barnes and Noble – Jacob’s favorite place on earth at the moment. He loves reading and playing with the Sesame Street stuffed animals (saying nothing about how much he loves the little train set that they have set up there). He’s also obsessed with these two Sesame Street cookbooks (future chef, maybe?). We left Barnes and Noble and went home for dinner, bath time and then bed. Sunday started off at 6:23am. As I look at those words on the screen, I can’t help but think about how blasphemous that must sound to any and all childless people. “Sunday started at 6:23am” Isn’t that where Saturday night ends for some people? I know it used to for me… I digress. I got cub, got us ready and we flew down to the Palisades to go to 9am services at SRF Lake Shrine. Following the services, he spent a solid 10 minutes going from flower to flower and plant to plant smelling the leaves and petals. I enjoyed every single second of it. It’s truly amazing how easily kids can remind you to stay in the moment if you’ll just let them. From Lake Shrine, we went to the Santa Monica Pier. He LOVED the pier! We walked all the way to the end and watched the waves come in. Then we sat down and had a snack. The whole week I told him that if he was good, we’d go to the pier and then to Kippy’s Ice Cream on Sunday. As we finished our snack, he looked up at me and said he wanted to go to Kippy’s. So we did. As an aside, if you haven’t been, GO. It’s absolutely amazing! And it’s actually good for you too! He was excited to eat chocolate ice cream, so that’s what I got us. He took 2 bites and was done. Crazy, right? I ate the whole thing myself. Then he asked to go home, so I got him back in the car and looked at the clock. It was noon. I almost cried. How is it possible that we did so much and we were both so tired and it was only noon?! I thought for sure he’d nap on the way home. He didn’t. I tried to put him down when we got there. That didn’t work either. We hung out some more, and then went swimming together – it was so much fun! After swimming, I fed him and then we hung out until bath time. After the bath, I called Cherise to see when she’d be home – maybe we could wait up for her and he could see mommy before bed? As I hung up the phone, Jacob grabbed my hand and said: “Wanna go to bed”. Then he led me down the hall to his room. I read to him and he passed out in my arms. Cherise came home, and I passed out in hers. Not really – I just wanted to. 2. Single parents are super heroes. After 48 hours of daddy-Jacob time, I can honestly say that I’m happy to do it again any time and any place. 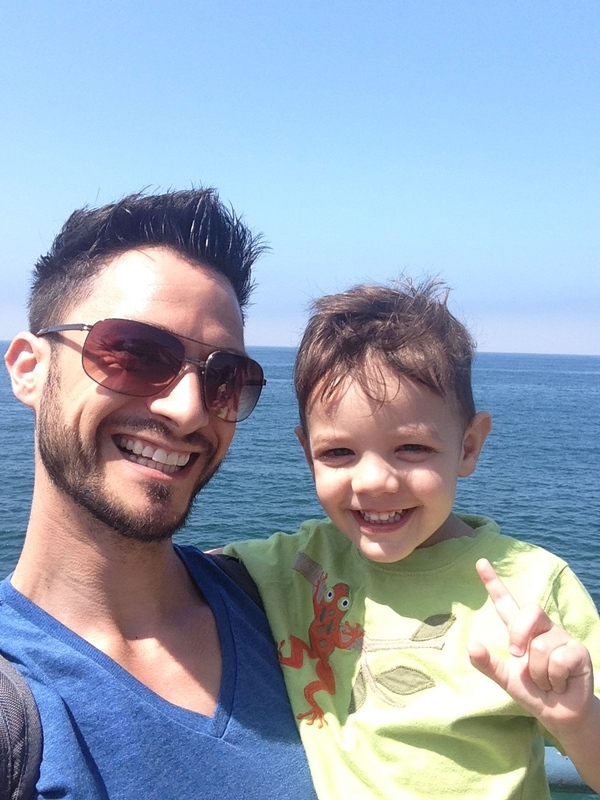 This entry was posted in Parenting and tagged barnes and noble, Bulletproof coffee, erewhon, father son time, love, pier, play, playing, reading, santa monica, single parents, super heroes, swimming. Bookmark the permalink.